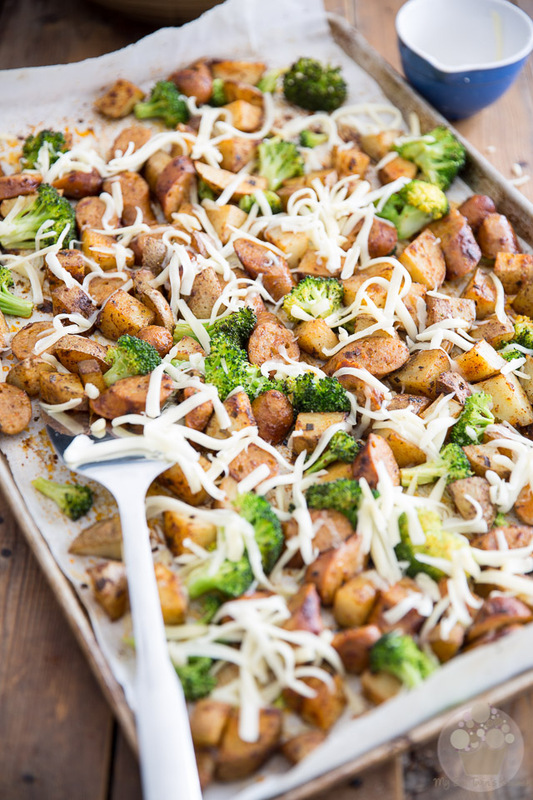 As uncomplicated to make as it is delicious to eat, this Sheet Pan Cheesy Roasted Potatoes and Sausage dish is sure to have the kids run to the table! 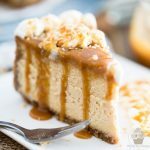 It feels like it’s been forever since I last posted a savory recipe on here. 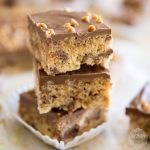 Frankly, I think this was WAY overdue and I should make it a habit to post more of them… Plus, it would do me a world of good to lay off the sugar for a bit. 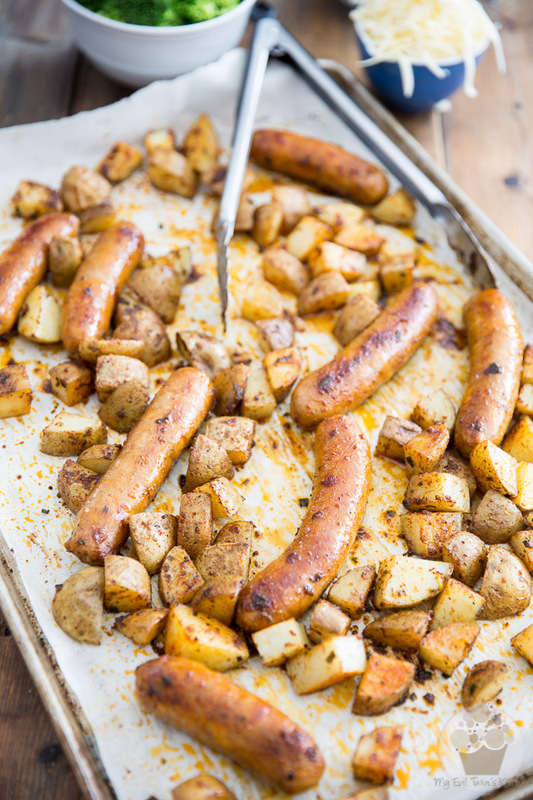 I hadn’t really planned on making an indulgent savory dish, but when my daughter sent me a picture of a sheet pan sausage dish that she’d made last week, I just started drooling so bad, I literally RAN to my kitchen to re-create my own version of it. Of course, I had to include cheese, and potatoes! I’m afraid I actually liked this dish a little bit too much and now wish I could have it on a regular basis. 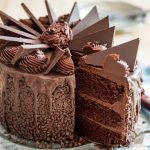 Mind you, it’s not THAT indulgent, so it wouldn’t be so bad… plus it could even be made super healthy, if one were so inclined. 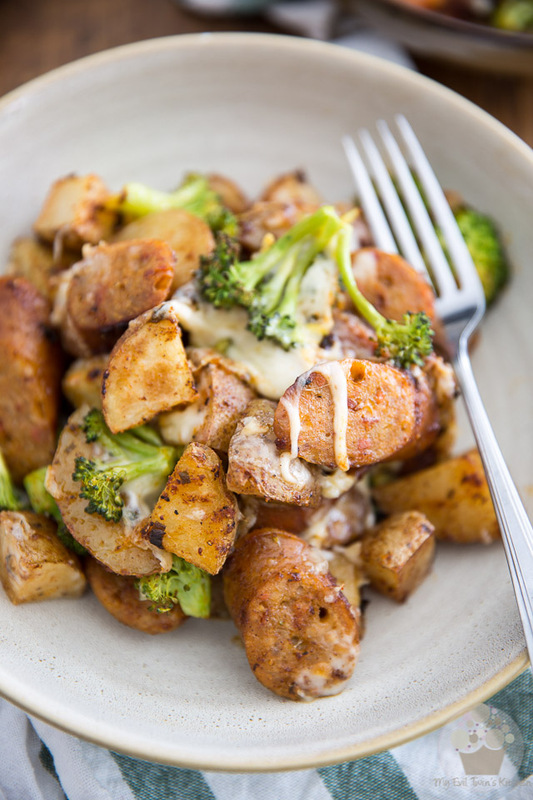 But if only for today, let’s splurge and treat ourselves to a beautiful plate filled with loads of pieces of bacon and cheddar sausages, roasted together in the same pan with big chunks of russet potatoes, a handful of broccoli florets (because hey, it adds color, and broccoli is good for you!) and then topped with a little bit of sharp cheddar cheese, for more cheesy goodness. 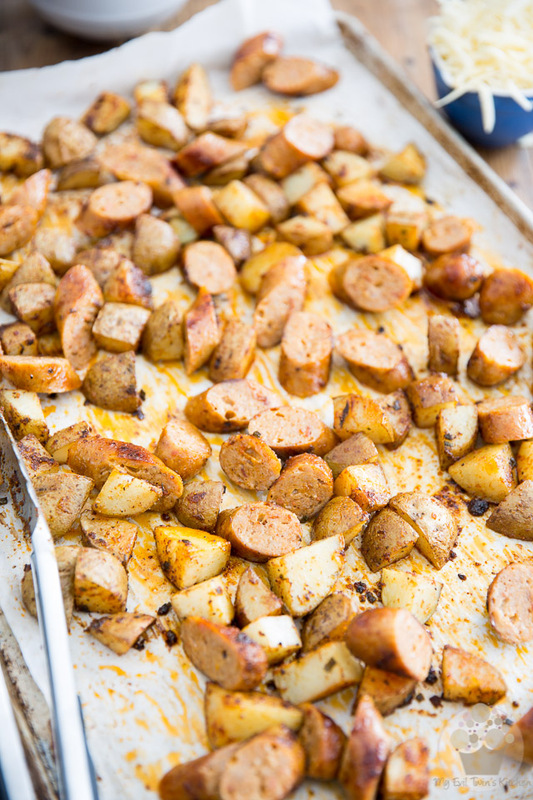 As uncomplicated to make as it is delicious to eat, this Sheet Pan Cheesy Roasted Potatoes and Sausage dish is sure to have the entire family, adults and kids alike, run to the table! 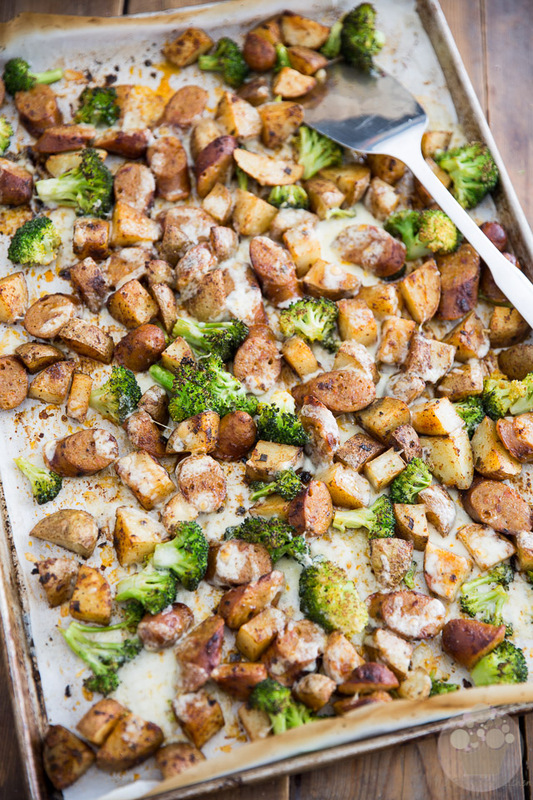 Preheat your oven to 425°F and line a large 13″ x 18″ baking sheet with parchment paper. Combine the dried chives, garlic powder, onion powder, smoked paprika, salt and pepper together in a small bowl. Mix until evenly combined. 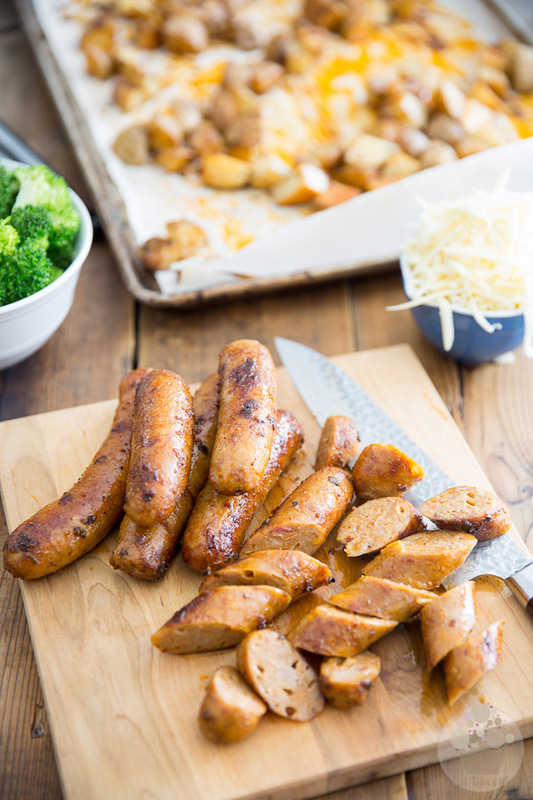 Arrange the potatoes and sausages in the baking sheet and sprinkle with the spice mix. Make sure that the sausages are nestled between the potatoes. 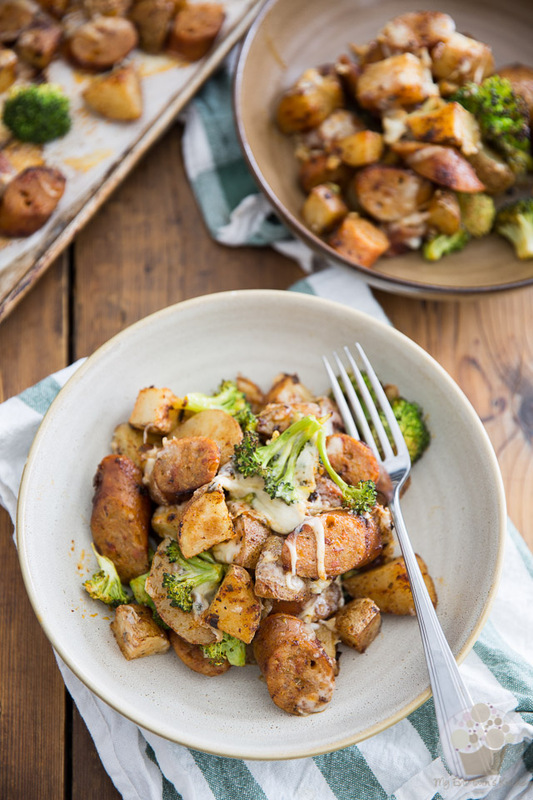 This will ensure that, as that fat escapes from the sausage, it mixes with the potatoes and coats them in all its deliciousness, helping them to crisp up and become all beautiful and golden and soft and yummy delicious. Place the pan in the oven and bake for 30 minutes, tossing the potatoes and flipping the sausages every 5 minutes or so, until the sausages are pretty much cooked through and the potatoes are soft and golden. 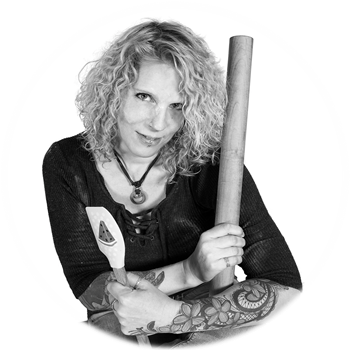 At first, you may feel that the whole thing is super dry and could use a little bit of oil, but trust the process. As they cook, the sausages will release plenty of fat and will make everything perfect. 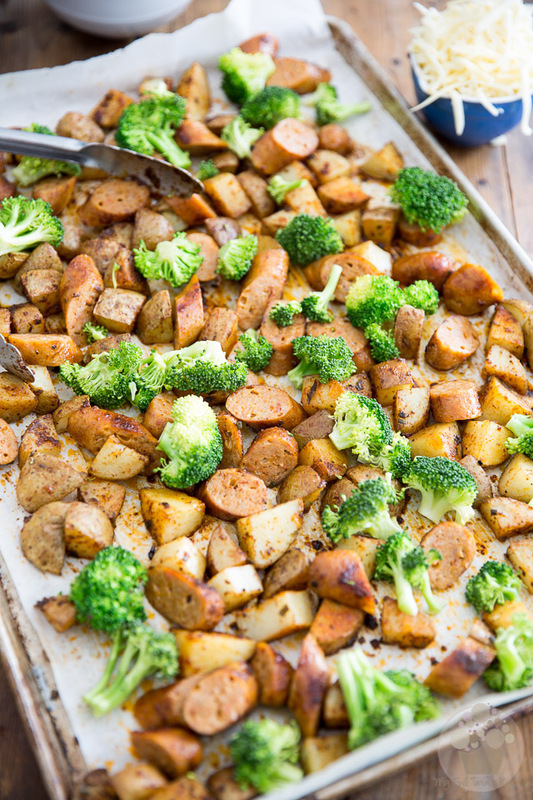 While the sausages and potatoes are roasting away, place the broccoli in a microwave-safe bowl, add about 1/4 cup of water and cover with plastic film, leaving vent hole for the air to escape. Microwave on high for 2 minutes, then let cool for a few minutes, carefully remove the plastic film and drain the water. Set aside. After 30 minutes, remove the pan from the oven and very carefully slice the sausages – they will be VERY hot, so if you don’t have bionic fingers like mine, you might want to use a pair of tongs to hold your sausages in place. Return the sliced sausages to the pan and mix well with the potatoes. 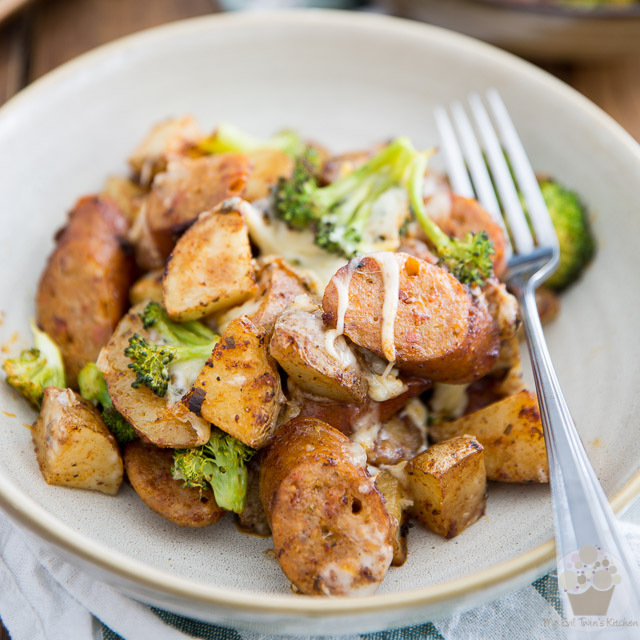 Scatter the broccoli florets across the pan and return to the oven for 5 to 10 minutes to crisp up the sausages and potatoes and finish cooking the broccoli. Set your oven to broil and remove the pan from the oven once again. 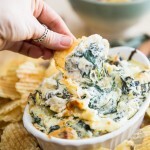 Sprinkle with the grated cheese and place under the b broiler until the cheese is melted and starts to turn golden. Serve without delay to your hungry crowd. Preheat your oven to 425°F and line a large 13" x 18" baking sheet with parchment paper. 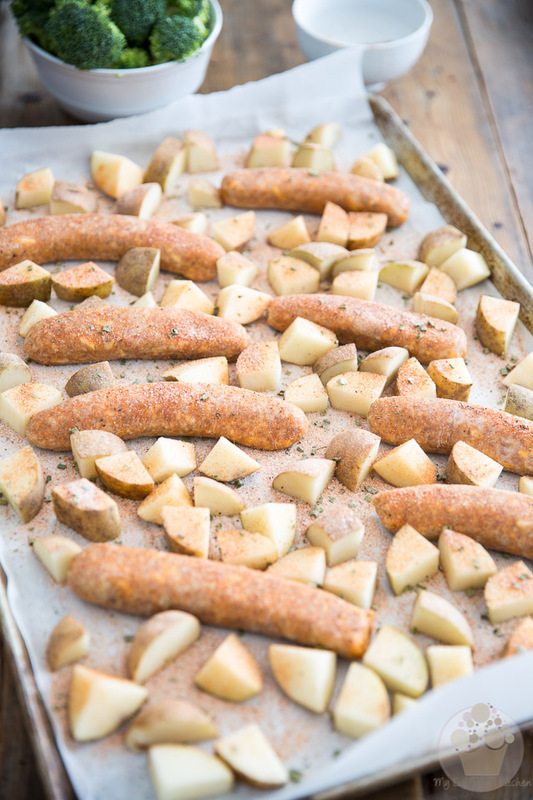 Arrange the potatoes and sausages in the baking sheet and sprinkle with the spice mix. Make sure that the sausages are nestled between the potatoes. Place in the oven and bake for 30 minutes, tossing the potatoes and flipping the sausages every 5 minutes or so, until the sausages are cooked through and the potatoes are soft and golden. Meanwhile, place the broccoli in a microwave-safe bowl, add about 1/4 cup of water and cover with plastic film, leaving a vent hole for the air to escape. Microwave on high for 2 minutes, then let cool for a few minutes, carefully remove the plastic film and drain the water. Set aside. Remove the pan from the oven and carefully slice the sausages, then return them to the pan. 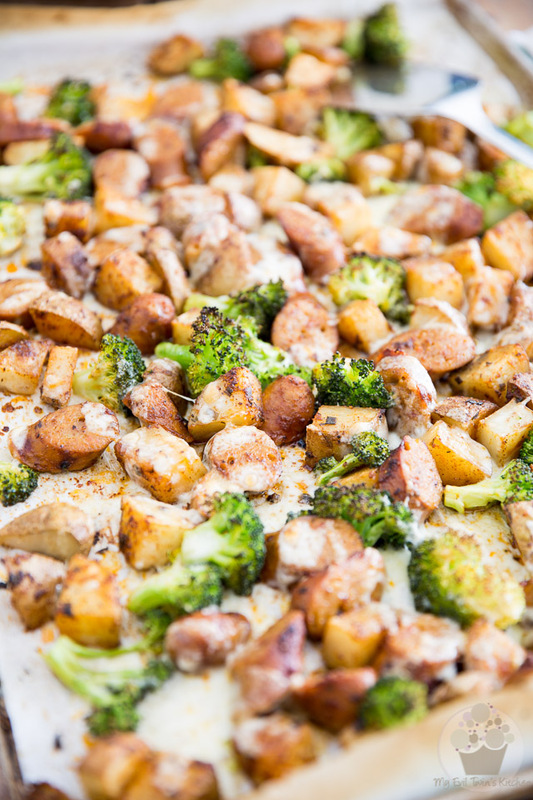 Add the broccoli and toss the ingredients around until they are well distributed. Return to the oven for 5-10 minutes to crisp up the sausages and potatoes and finish cooking the broccoli. Which brand of sausage would you suggest? I’m in the USA and not sure what qualifies as “European” sausage. I can’t recommend a brand of sausage in particular, Maxine. In fact, you can use any sausage of your liking. Big fat Italian type sausages work best, though.